Read more about our two students who have returned to school after professional careers to study diligently in their chosen field. 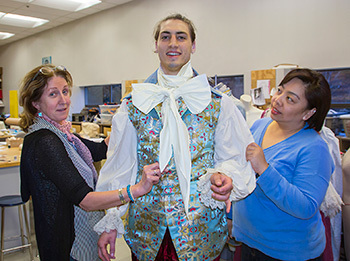 As well as being students, the director and the costume designer of the Phoenix Theatre's upcoming play Amadeus have many other things in common. Both born abroad, they've found their way to Canada and to Victoria. 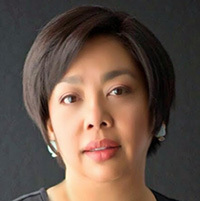 Director Chari Arespacochaga (shown right) came only recently from the Philippines to return to school and get her MFA here at UVic's Department of Theatre. 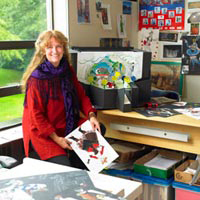 Costume designer Pauline Stynes emigrated from Ireland as a young woman, and has been living and working on the west coast for over 20 years. 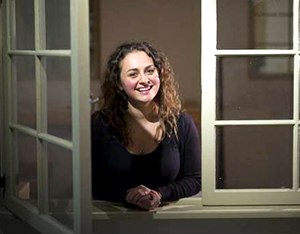 Like many MFA students, director Chari Arespacochaga came to UVic to further her education with an already-strong resume in professional theatre. "I took a summer performance workshop as a young teen and never looked back from then." She was already working with a local repertory theatre in Manilla while persuing her degree in film. She was a professional actor and teacher for years before finding her way to directing. 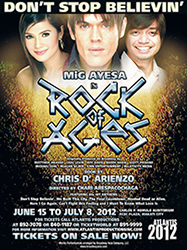 Since then she has been working with Atlantis Productions in Manilla for over eight years and directing major Broadway shows in Manila often bringing in big foreign stars (including Mig Ayesa for Rock of Ages, who was one of the final three contestants in the TV series Rock Star to be the new lead singer of INXS). Many of these shows toured across Asia or were remounting in Singapore. Her credits include many musicals including Footloose The Musical, Doubt, Spring Awakening, The Full Monty, Legally Blonde, Avenue Q, as well as several Disney productions like The Little Mermaid, Aladdin, and Tarzan. Chari decided to reimagine the play so that it was completely set in the asylum where Antonio Salieri spends the last night of life. Here Salieri shares his memories as a court composer and his devious schemes to destroy the career of his rival, the young prodigy Mozart. In this reimagined setting – complete with asylum patients that pseudo-transform into the members of the 18th-century court – the play emphasizes a more skewed reading of Salieri’s memories and perhaps leads one to ask if Salieri’s final confession is only his final attempt to escape his own insignificant artistic legacy? Returning to school was a good decision for Pauline, one that has already seen some recognition in Victoria’s theatre community. Last year she beat out the city’s best as winner of the Critics’ Choice Spotlight Award for Best Costume Design for the Phoenix’s production of Picnic last spring (shown left). It has also led her to get involved in several local productions, including A Christmas Carol, Let Me Call You Sweetheart and Equivocation at the Belfry, My Fair Lady at Blue Bridge, Smalltown: A Pick Up Musical with Theatre SKAM and Thoroughly Modern Millie with the Victoria Operatic Society. She was also Head of Wardrobe for the world-premiere production of Aventa Ensemble’s opera Marilyn Forever. And while education will help them both expand their horizons, the key for both Pauline and Chari is their absolute love for the theatrical world, and it is this passion that will bring Mozart and Salieri's fascinating story to life. 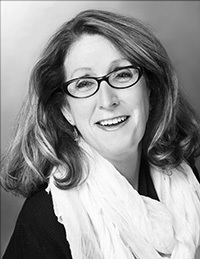 Read Chari's interview with Hannah Wolf on the "Ask a Director" blog. 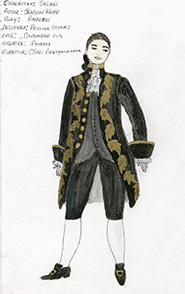 See more of Pauline Stynes' costume designs for Amadeus on Pinterest. 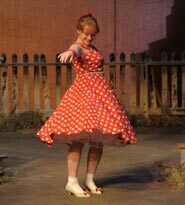 See photos of Pauline Stynes' award-winning Picnic costume designs from last season on Facebook. Production photo of Picnic by David Lowes, Art Studio 21. Available preview tickets are made available to the public at 5pm on the peformance day. Wolfgang Amadeus Mozart is often considered the greatest musical genius the world has ever known. To his 18th-century contemporary, Antonio Salieri, he was vulgar, boorish, and unforgivably brilliant – thus an enemy to be eliminated. Seen through the envious eyes and maybe-skewed memory of the aging Salieri, the play chronicles their tumultuous rivalry, and Salieri’s devious efforts to destroy Mozart’s career, even while recognizing the genius of his music. But is this final confession merely Salieri’s last attempt to escape his own insignificant artistic legacy? The winner of seven Tony Awards, including Best Play, Shaffer’s masterpiece also inspired the much-loved Academy Award-winning movie. Box Office opens for single tickets for Amadeus on March 3. Lots happening near and far for our alumni. Great news across from Phoenixers across the country and across the world! 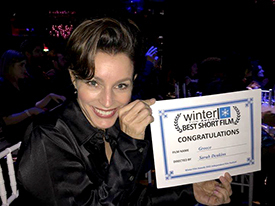 Greece, a short film written by, directed by and starring alumna Sarah Deakins (BFA’91) just recently added “Best Short Film” at the New York Winter Film Awards to its already-impressive list of accolades – which also include being a Platinum Winner at the International Independent Film Awards and the Award for Excellence at this year’s Indiefest Film Awards. Sarah has also won a few awards herself for her various roles in the project, including recognition for her directing and filmmaking, as well as several awards for Lead Actress. Congratulations, Sarah! We’re excited to watch your success continue! 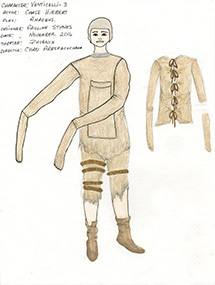 Designs by professor Mary Kerr will be included Costume at the Turn of the Century 1990-2015, an international curated exhibition being held in the A.A. Bakhrushin State Central Theatre Museum in Moscow. The goal is to showcase the development of ideas, materials and technologies of costume design over the past twenty-five years from all over the world in theatre, opera, dance, film, fashion design, performance art. The exhibition will include costume renderings, production photos or artistic images, or short performance videos as well as actual costumes. From even further afield, our very own technical director and lighting instructor Tim O’Gorman worked as the Production Manager for Marilyn Forever at Australia’s renowned Adelaide Festival! During his visit to the land down under, Tim worked on this project with UVic School of Music instructor Bill Linwood who is also the conductor/artistic director for Canada’s prestigious Aventa Ensemble, as well as stage director Joel Ivany, a rising star in the Opera/Theatre world. Marilyn Forever ran from February 27 – March 1 and was received with glowing reviews! Chelsea Haberlin (BFA ’07) has been named (by Arts Club Theatre’s Bill Millerd) as one of the next generation of "Innovators" in a Globe and Mail article where she says “I think theatre should be a party." She is the Co-Artistic Director of ITSAZOO Production with fellow alumni Sebastian Archibald (BFA ’07) (also the Playwright-in-Residence) and describes the recent direction of their work as "in-yer-face immersive work.” Meredith Grantier (BFA ’07) and Kyle Sutherland (BFA ’04) are designers in residence. Earlier this year, alumna Michelle Monteith (BFA’98) featured in the world premiere of Diane Flack’s play, Waiting Room, at the Tarragon Theatre in Toronto. 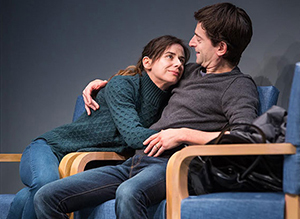 The play, inspired by Flack’s own experiences waiting at Toronto’s Sick Kids Hospital, ran from January 6 to February 15 and received a great review in the Globe and Mail. Congratulations Michelle! Around Victoria, you can find lots of Phoenix alumni involved in almost every company in town! Trevor Hinton (BFA’07) plays the character Lucky in the Blue Bridge Repertory Theatre’s production of Waiting for Godot from March 3-15. Trevor also recently appeared in Kaleidoscope Theatre’s The Secret Garden. At Langham Court Theatre, you can see recent grad Cecilly Day (BFA’14) in their production, The Mystery of Edwin Drood, running March 5 – 21. Break a leg, Cecilly! Earlier in March, alumnus and return-student Ian Simms (BFA’14) and Theatre Theatre company presented his show Agency and Empathy at the Intrepid Theatre Club as part of their YOU Show series. This is their second production after the highly acclaimed 2014 Fringe show,The Stephen Harper Play. 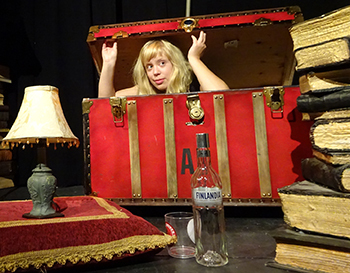 Theatre Inconnu's Alien Creature was directed by alumna Jocelyne Lamarche (BFA ’14) and featutred also-alum Tannis Perry (BFA’14) (shown on set in photo on right.) The show had a great run early this month and received excellent reviews! Congratulations both of you! Alumnus Max Johnson (BFA'14) will spend a week in March in residence at the funky Hotel Zed in downtown Victoria. Johnson, who is the Associate Artistic Producer for TheatreSKAM will undertake a marathon playwriting session, writing and revising his play Monopolis, a fictionalized account of the late '90s dot-com market crash. At the end of the week, he will offer a work-in-progress happy hour reading on Friday, March 13, from 5-7pm. Watch for current department or alumni stories by liking us on Facebook or following us on Twitter. Use #phoenixalumni to stream on our alumni website or tag @UVicPhoenix for us to retweet your event!